First, that was a wonderful Black Moon Eclipse gathering on Sunday evening at Church. Bless you Catherine and Michael for bringing the delicious Rustica pizza and fine wines. To go with my cup cakes! While the skies looked dismal at first, it was cold and raining and cloudy, we waited patiently. And eventually our patience and faith paid off big time! We first gathered in the Fellowship Hall, watching the live video stream of the Moon from the Griffith Planetarium and Observatory in Los Angeles. High up on Mulholland Drive – they had a great moon camera view….we had clouds and rain at Church at that time! But that didn’t last for long……..
Then we viewed together the moving and powerful “I Have a Dream” poetic, emotional speech by Rev. Dr. Martin Luther King, Jr. Still so very relevant today as it was in March of 1963 when he gave it on the Mall in Washington DC. It was great, specially after Pastor Laurie’s children’s time. She taught me how he came to have the name Martin Luther, among other things. Then the clouds began to part, I was out doing Moon Watch patrol at the labyrinth. First a few bright stars appeared, and then Ms. Moon! We saw her gradually become covered from the bottom edge by Mother Earth’s shadow. Clouds kept coming and going, making for a most dramatic viewing experience. Pastor Laurie arrived and a few others, and we got to see totality begin! I had to play some of my Black Moon Etudes on the Sanctuary piano – that seemed to encourage the clouds to part again. We had all moved into the Sanctuary in almost complete darkness – it was awesome. But then we moved back to the Labyrinth together. Chilly it was, but worth it! Then a large stratus cloud layer moved in, and it appeared that we were done seeing much after that. So most everyone departed, but I stayed. And then the stratus clouds vanished to the east. And a totally clear sky was there for all of the totality phase. Many major constellations became crystal clear. The Pleades, Taurus the Bull with Aldebaran his bright orange eye. Orion in all his glory, with his trusty hunting dog Canis Major! His nose, eyes, and ears were so clearly visible, with the brightest star Sirius glowing pure white! Over to Gemini with the twin stars Castor and Pollux super clear. Even Cassiopea on her throne was revealed, along with the Big Dipper and Polaris, the north star. It was one of the best 10 clear view nights I ever saw around this large urban area of Oakland/Berkeley. It was totally dark at the Church, but then a voice called out around 10 PM – it was Mimi Chan from HEIA! She is the Board Chair for HEIA. I had set up my 90mm Meade telescope so we got some great views of Ms. 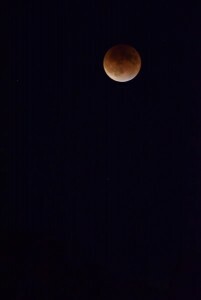 Moon in totality. By 10:30 totality had cleared and the light edge of the Moon was coming in from the left side, not the bottom! So I decided to pack up my gear and head to home, 1/2 mile away. Could view the Moon there because now she was high enough in the sky. But then it started to rain again! HAH! It was very nice and quiet and dark up on Skyline at that late, wet hour of a Sunday night. Pastor Laurie texted me from her home about how clear the skies had become! She was viewing Ms. Moon there – Thanks! And I replied that I was still up at Church. So to those who came (Carolyn, Rod, Mirtha and Johann, Nancy, my wife Candice, Pastor Laurie, Jim Schubert & family) it was very special to share this unique and blessed experience together with you. And it worked out great to see so much of the eclipse from such a special location and together! I may well host other “Astro Nights” in the coming months at Skyline Community Church when special events occur. Meteor showers, more full moons rising in the east, star and constellation tours – stay tuned! Or if there is just plain great “seeing” nights – dry, clear, crisp skies – but it’s often on the chilly side for that. Where were you on Sunday evening, around 7:41 pm? By any chance, were you outside looking east? Hopefully, you had a chance to see it too… the supermoon, blood moon, lunar eclipse! A rare and beautiful sight! If not, below are some links to photos from around North America and Europe to enjoy! Another awesome reminder of how vast and beautiful this creation that we are all a part of is.